For the second year in a row, I am using the Amazon Universal Wish List to put together lists of items my three children would want and need for Christmas and birthday gifts. As their parent, I feel like I know best about what my children's interests are and what items gift buyers should avoid. Since our children's birthdays all fall in January, you can imagine how high the risk of duplicate gifts may be. I have even added the "Add To Wish List" button to my toolbar, so I can add any item I see from whatever website on which I happen to be browsing. I usually add items in a variety of price ranges and it seems to work out well for everybody. 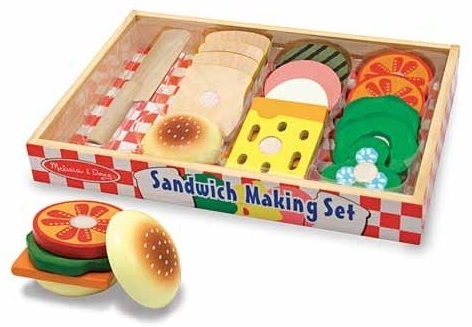 I just added this Sandwich Making Set by Melissa & Doug to my 3 year old son's wish list, which I came across on GrowsUp.com . This site was recently brought to my attention and I wish I had found it sooner. GrowsUp.com contains micro boutiques from some of my favorite children's brands, such as Melissa & Doug, KidKraft, Green Toys, and more. The site even sells one of my favorite items ever . . . the Teagan & Mack Pearl Bracelet my daughter has been wearing since September. In fact, I have seen many items I own on this site, which just proves to me that the collection of brands represented on GrowsUp.com is a perfect fit for my family. If you are a one-stop-shop kind of person, then I highly recommend you check it out for yourself.